City Council President Caesar Mitchell, who ran for mayor, called for Reed and the city council to put a moratorium on the approval of city contracts that start next year, so the next mayor and council can weigh in. 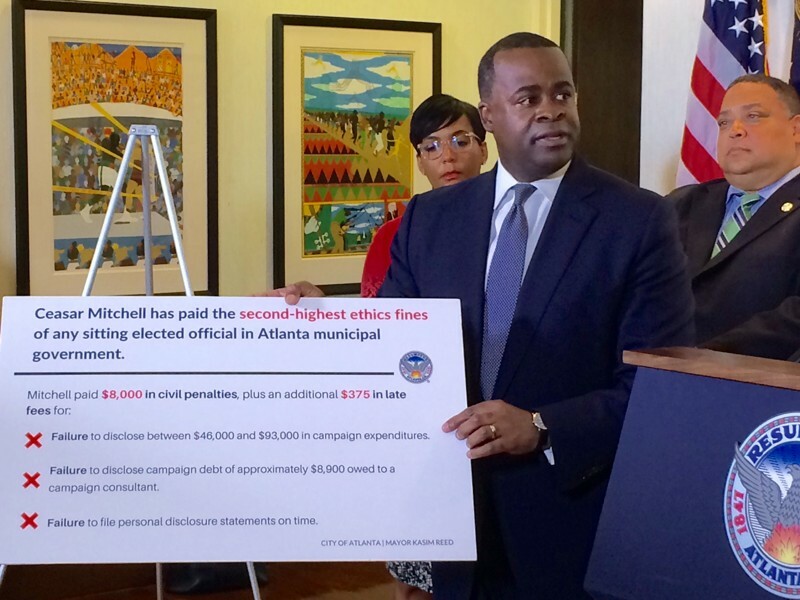 Mayor Reed convened a press conference to blast Mitchell over his past ethics violations which included large visuals of an infographic detailing Mitchell’s misdealings. To further embarrass Mitchell, this infographic remained on an easel outside of the Mayor’s office in subsequent days. Mayoral candidate and former Fulton County Commission Chairman John Eaves made, according to Reed, false claims about his role in a Phillips Arena business deal. Reed’s administration released a scathing press release with an opening line, “Tell the truth: John Eaves is launching his losing campaign with a lie”. I giggled. But, Reed did not stop there, he dug up receipts of Eaves’ questionable responses to the Zika and West Nile epidemics and reminded the public of the closing of key voter precincts under Eaves’ watch. Reed also took a dig at Eaves’ failed city council run years prior. In true petty form, Reed ensured that he enlisted co-signers – the Atlanta Hawks also weighed in. When Caesar Mitchell announced that he would be supporting Mary Norwood in the run-off election, many were surprised. Norwood touts herself as an independent, but her 70% Republican voting record, attendance at past Republican National Conventions, and refusal to acknowledge that racial profiling is an issue say otherwise. When asked for a comment, Reed had a classic one-liner that is sure to go down in black political infamy. Why do I bring this up? Well, if you are a member of the Black Atlanta delegation, these incidents may be familiar. Many of us followed the back and forth closely and discussed it on social media – it is entertaining AF. But petty politics may have overshadowed the real need: there was simply not enough focus and community dialogue on the black political agenda. Maybe this is why we have this tense and divisive run-off today? 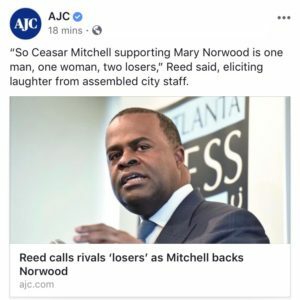 Should Mayor Reed have stayed out of this mayoral race all together? Is this why people are turned away from current City Hall leadership? Sigh.